To a 25% full house, Metric Took the Stage. The foursome looked tiny positioned on the huge stage. Likely selected because they are… solid. Unmemorable. Usual. Unimaginative, I found myself looking away, and waiting for the 45-minute set to end. They were nearly void of movement except for the brief bursts of jazzercize moves by vocalist, and sometimes keyboards and guitars, Emily Savitri Haines. Part of the looking away was from the seizure causing low lights that flashed right in our eyes and made it almost painful. The sound was louder than the recent Judas Priest/Saxon show, and Haines’ vocals were sometimes ear piercing. A combination of Amy Mann and Olivia Newton John or Blondie meets the Go Gos, they displayed pretty harmonies on occasion. Irritatingly often, they reminded us of their name, and that repetitiveness carried over in her vocal patterns, as well as lyrics; each song sounded the same to me. There were a few interesting low turns where you predicted they would go high, and a reputable amount of haunting tones stood out among the unoriginal-ness of this band. Between songs, someone in the now 50% full crowd yelled “Slayer” numerous times. The last song from what I could make out of the lyrics was “Eat me alive the hammer,” which was repeated maybe 50 times (OK, I’m exaggerating a little.) As she winded down the show, she pumped her fist in the air, encouraging us to do the same; I counted exactly four people following her example. If I were writing this review about Meshuggah or In Flames, Grave or Gojira, I could tell you every nuance, note, lyric, and melody. 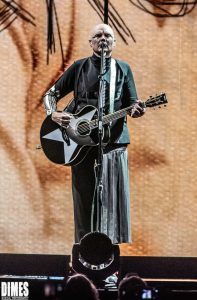 I am a metal fan and thought I knew enough about The Smashing Pumpkins to adequately review the show; I had no idea the magnitude of Billy Corgan. The venue was packed. Everyone was standing. Everyone was singing. The shrieks and screams and applause were deafening. In what would be the most awesome visual performance I’ve ever seen, Corgan was like a superhero of amazing proportions. I sat next to a group of writers in our media row, and they were all very knowledgeable about The Smashing Pumpkins and this “The Shiny and Oh So Bright tour.” They talked in depth about albums, years, gossip, career moves, smart touring, mediocre albums, and brilliant songs, and I felt a tiny bit unqualified to be there. The spectacular performance by The Smashing Pumpkins made me actually feel sad that I missed them in their prime, although they were absolutely in their prime on this night. In this three-plus hour, 30+ song set, he performed hits, covers, and the lesser known songs in his massive catalog of songs. While the covers were unnecessary in this massive set-list, (and some weren’t even good like “Space Oddity,” the sheer volume of songs, and energy it took to perform them was no less than spectacular. Unfortunately, either we can’t stand still for three plus hours, or Corgan fizzled out at the end, about half of the audience began to trickle out at abut the half-way point. I’m putting my money on the fact that our attention span shortens with age. From those curious to see “how he looks now, years later,” to the serious die-hard fans, Corgan put on a show that will be hard to beat for 2018. 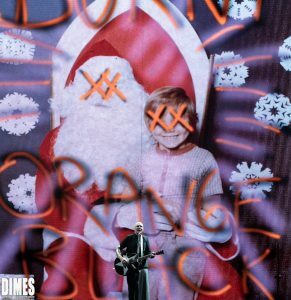 Visually it was an amazing display of technology, creativity, and nostalgia; vocally, it proved why The Smashing Pumpkins, aka, Corgan, will be around for a long, long time.